Passenger service: October 1904 - December 1948. Existing abandoned portions: Portions of track and track-level platforms, 8 loop tracks. Touring: J M Z trains to Essex St. Look into the space south of the station when no Brooklyn-bound train is in the station. The Williamsburg Bridge is a suspension bridge designed by Leffert Lefferts Buck in 1897 for the New East River Bridge Commission, a body jointly constituted by the City of New York and the City of Brooklyn. It was the second East River bridge, after the New York and Brooklyn Bridge, opened in 1883. The bridge was to support six railway tracks. Down the center are two elevated railroad tracks, still in use for the J M Z trains, that run into an underground station in Manhattan, originally a terminal, under the north side of the bridge plaza. Flanking them were a pair of pedestrian walkways over two streetcar tracks each. The north pair of tracks were used by Manhattan conduit cars running from street railways to a terminal at the bridge plaza in Williamsburg. The south pair carried Brooklyn trolley cars to an underground terminal in Manhattan with eight loop tracks under the south side of the bridge plaza. On the outer edges of the bridge were wagon lanes. Key: BC Brooklyn City; BQC&S Brooklyn, Queens County and Suburban; CI&B Coney Island and Brooklyn; NE Nassau Electric; SB South Brooklyn. The City contracted for use of the bridge railway to the Bridge Operating Company, formed July 1904 and owned half and half by the Brooklyn Rapid Transit (BRT) and Metropolitan Street Railway systems. Bridge Operating actually operated the bridge local cars, under a statutory 3 cent fare, and also contracted out use of the tracks by other streetcar companies for through service. In the case of the underground terminal and the south side tracks, all the companies were BRT divisions except the Coney Island and Brooklyn. By 1908, the BRT was operating the local cars on behalf of Bridge Operating. Following the financial collapse of the BRT in January 1919, later that year the Brooklyn City Rail Road lines were placed under separate management. The BRT system was reorganized in May 1923 as the Brooklyn-Manhattan Transit system (BMT), still not including the Brooklyn City nor Coney Island and Brooklyn lines. The City acquired the Bridge Operating Company in 1920 and contracted use of the tracks directly. All Brooklyn carlines were withdrawn in December 1923. From that time till February 1931, only bridge locals were operated on the south side tracks, by the City's Department of Plant and Structures. After that date, through service was resumed from some of the Brooklyn carlines, now united under the BMT system, but this last for-profit operation lasted only nine years, till the whole BMT system was acquired by the Board of Transportation in 1940. BMT trolleys continued to run on the bridge until 1948, when the streetcar track on the bridge and the underground terminal were abandoned. The underground terminal for the elevated railroad adjacent to the trolley terminal opened on 16 September 1908. The station was rebuilt for through service in 1911-1913 to the Centre St Subway extending to Chambers St. The subway has four tracks while there was room at Essex St station for only three tracks and two platforms. There is provision for a fourth track to run through the trolley terminal area and join the subway west of the trolley terminal, should a four track subway station be wanted. For many years, the elevated train service was very intensive and a fourth track at Essex St would have been useful to handle the crowds, but at the same time the trolley service was also well patronized, so no expansion was ever proposed. The streetcar terminal originally had entrances in the bridge plaza at street level. At about the time the Independent subway was opened in January 1936, the street entrances were replaced by a new passageway under track level. After streetcar service ended in 1948, the former track area on the bridge was rebuilt into auto lanes with a new ramp from street level closing off the former downhill ramp to the trolley terminal. The trolley terminal itself however was just left vacant, and only small portions converted to storerooms. It is still there with the dust of over fifty years almost smoothing over the tracks. Construction work on the Centre St subway starting in 2001 may lead to changes. Footnote: the Manhattan streetcar lanes on the north side of the bridge were in use until 1932. The original services were to three Metropolitan Street Railway routes (8 St Crosstown, 14 St Crosstown, and 4 Ave to Grand Central) and one Dry Dock, East Broadway and Battery Rail Road route (Grand St Crosstown). The Met system collapsed in 1911, and its successor New York Railways operated one carline over the bridge, the 7 Ave-Brooklyn route, until 1919. From that time forward, only the Dry Dock operated on the north side tracks, with two routes, the Grand St Crosstown and a diagonal route from Park Row via the Bowery called Post Office. When the Dry Dock abandoned all service in 1932, operation on the north side tracks ended. The diagram shows the underground terminal south of the open Essex St subway station. Two potential trackways, never opened, could run from the west end of the trolley station into the subway line. East of the trolley terminal, the trackway for two tracks comes out of the portal and then disappears under a roadway for auto lanes from street level onto the former trolley lanes of the bridge. A diagram by Bruce Lane for a trip brochure of the New York Division, Electric Railroaders' Association, 1983, shows the original 1908 track plan of the two terminals. The subway station was rebuilt to three tracks, but the trolley station remained the same. There was a stub track past loop 1 that could hold two cars. An undated photo shows the terminal in operation sometime before 1935. The separate stairs to each loop are still in place. The entire space is paved to rail level, simulating a street terminal. The trolley wires are protected by wooden channels from any contact with the steel structure. Passengers are waiting at what appears to be the Loop 1 and therefore, depending on the date, for a Nostrand Ave car or a bridge local. The subway station is out of sight on the right. Source unknown. From James C Greller and Edward B Watson, Brooklyn Trolleys, N J International, 1986. A photo taken in 2001 by Mike Fagan shows one of the trolley loops with the Essex St subway station the background. 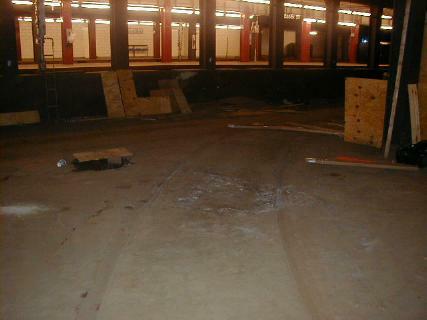 The trolley terminal was being cleared by the contractor beginning work on the Centre St subway line. Photo copyright 2001 by Mike Fagan. Thanks to Kevin Walsh. A photo taken in 1919 shows the bridge approach in Delancey St. The stone kiosks in the center of the photo go down to the underground trolley terminal, while the larger one to the left goes to to the subway station. In the foreground there are waiting areas for the several Manhattan streetcar lines that terminated here without going over the bridge. All this has since been cleared away to make more room for auto traffic. At the bridge entrance, a portico covered an opening on each side of a center stone wall holding a large plaque. The opening on the left was for Manhattan streetcars. A car has just come out and is turning into Clinton St on its way to 59 St via 8 St and 7 Ave. The opening on the right, located directly over the portal of the underground trolley terminal, was the pedestrian entrance. Inside is a stairway up to the deck level, leading to the two pedestrian walkways on the bridge that are directly over the streetcar tracks. To the right of the portico is the auto lane to Brooklyn. The other auto lane is somewhat obscured by shadow to left of the portico, but an auto and a truck can be seen waiting for the streetcar to clear the way. Source unknown. From Edward B Watson, editor, New York Then and Now, New York: Dover Publications, 1976. The 1928 Red Book guide to Brooklyn listed only the bridge local running over the bridge, and notes the 3 cent fare. Washington Plaza is at the Brooklyn end of the bridge. The Geographia Street Guide to Brooklyn of 1939 lists the last three through carlines over the bridge. Photos of Essex St station adjacent to the trolley terminal can be found on the New York Subway Resources site, http://www.nycsubway.org.